For my first project with Zapworks, I tried to make a simple car model following a berzier curve. I used the timeline and put many keyframes. It works, but I soon decided to replace the 3d model. 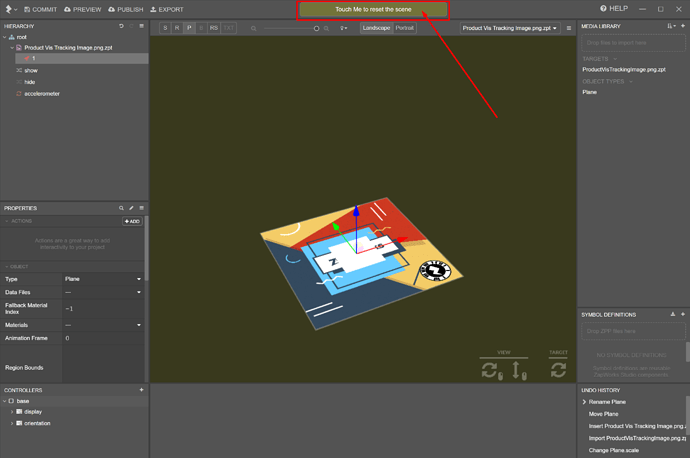 I used “Symbol Definition”, and changed it to a new symbol with 3d model, but can’t see any change. Then finally I restarted Zapworks application and can finally see the change. I think it’s a bug (Zapworks v6.2.8 stable, OSX). You can reset the scene preview at any time by clicking on the ‘Breadcrumb’ bar at the top (highlighted below). When changing an objects ‘Source’ or ‘Symbol Definitions’ property, the Breadcrumb bar must be pressed to update the preview.